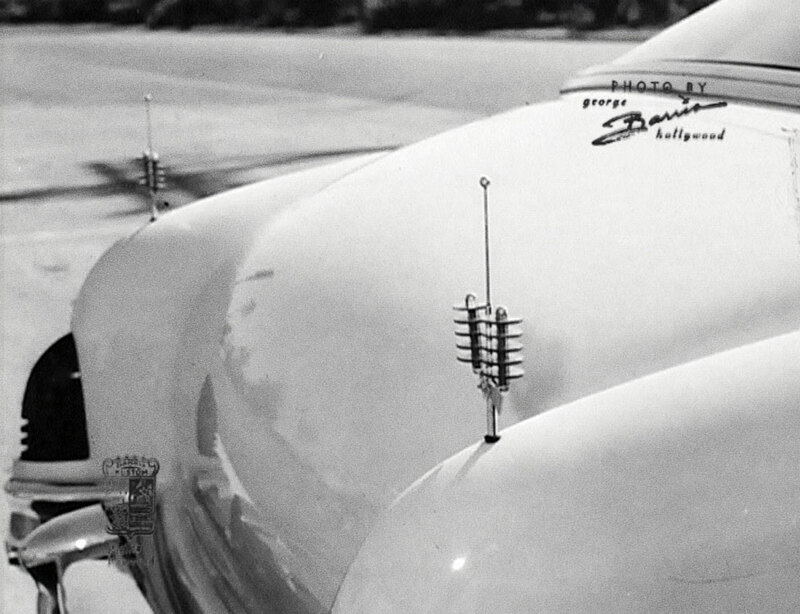 For a short time in 1953 Bob Hirohata had a set of futuristic antennas on his famous Barris Kustoms built 1951 Mercury. Ever wondered where those came from? 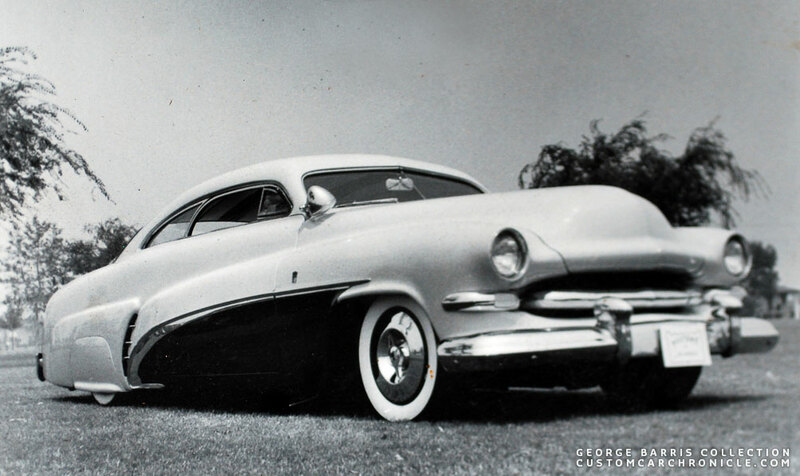 In the Barris Kustom Techniques of the 50’s book Volume 1, first published in 1996, there is a photo on page 94 showing the Hirohata Mercury photographed at a park with a set of strange looking, futuristic double, or triple antenna’s. This was the first time I had seen these antenna’s on any photo of the hirohata Mercury. The antenna’s were pretty small in this picture, but I was already wondering what they where. 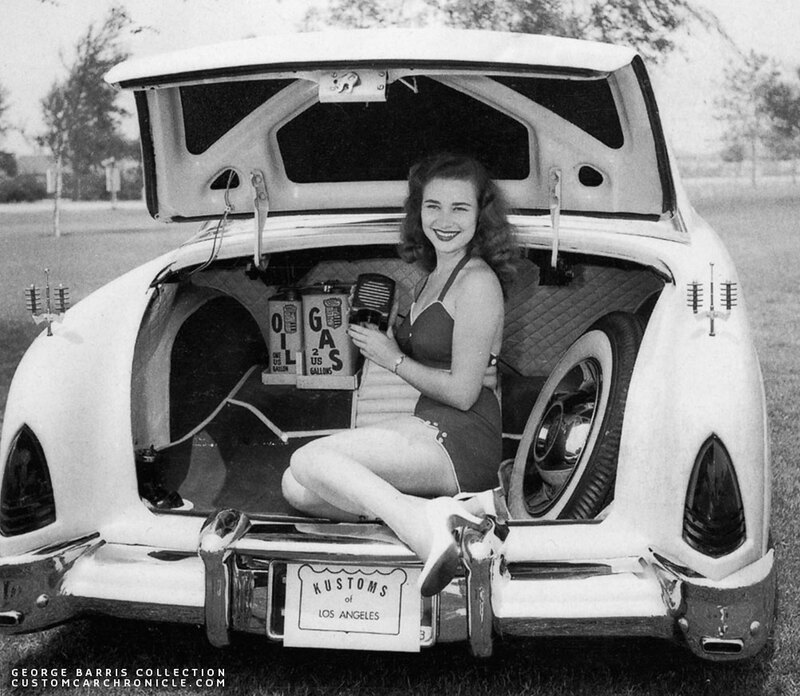 Then a year or so later in the Barris Kustom Techniques of the 50’s book Volume 3 there is a close up photo of the rear of the Hirohata Mercury with a model in the open trunk on the “frontispiece”. In this photo we can get a really good look at those strange looking antenna’s. Ever since I saw this photo I have been trying to find out if perhaps Bob Hirohata got creative with some green colored plexiglas sheets and created these antenna’s himself, or if they were some sort of aftermarket product. 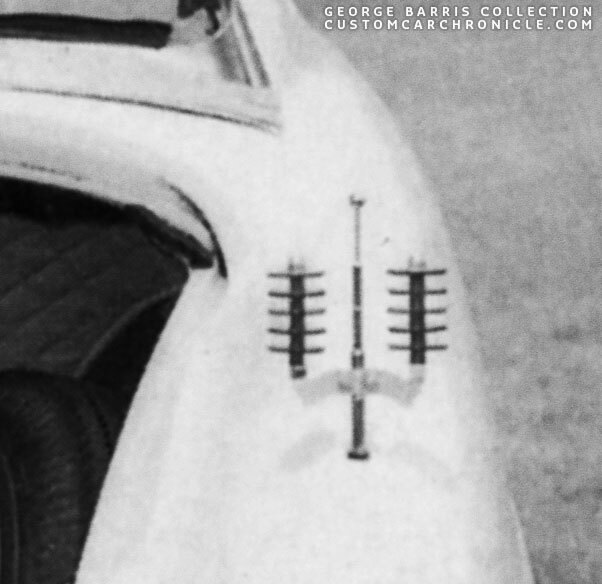 This is the photo that appeared in the Barris Kustom Techniques of the 50’s book Volume 3 showing the odd antennas really well. 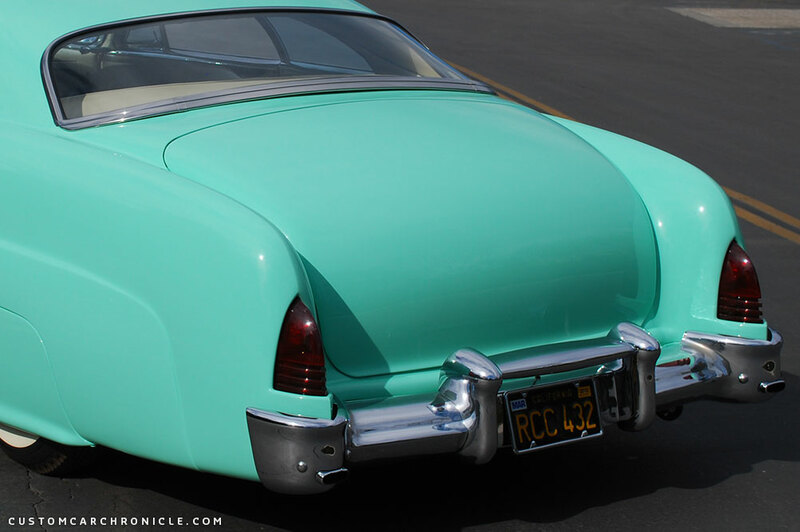 The license plate, mostly covered by the Kustoms of Los Angeles card shows that this must have been around 1953. If you look hard you can see these antenna’s also in this photo. This photo was taken at the same time and same location as the trunk with model photo shown above. 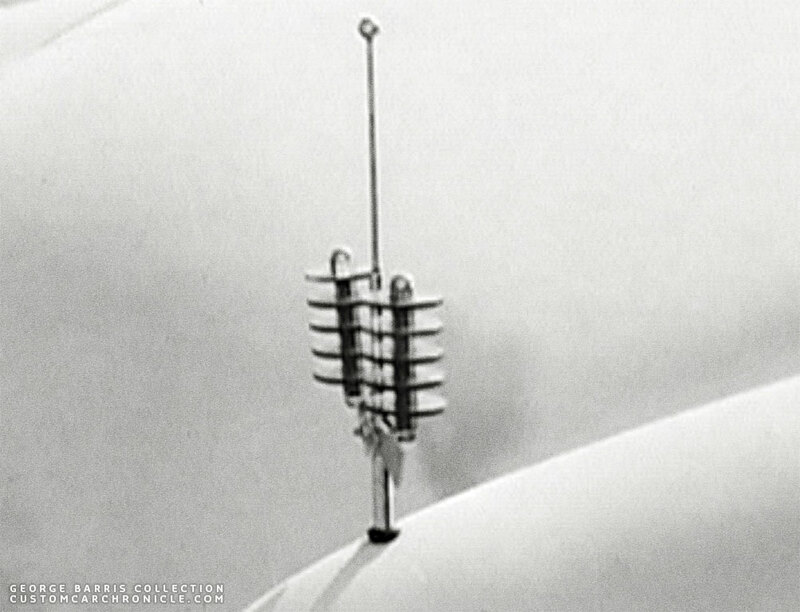 Bob had these antenna’s on the car at the time he had replaced the Sombrero hubcaps with the 1953 Cadillac units. 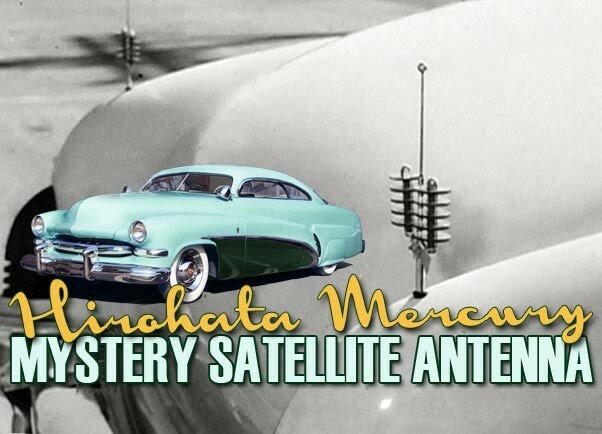 I always thought these antenna’s did not really fitted the Hirohata merc very well, at least not in the time period they were on the car, which was somewhere around 1953. 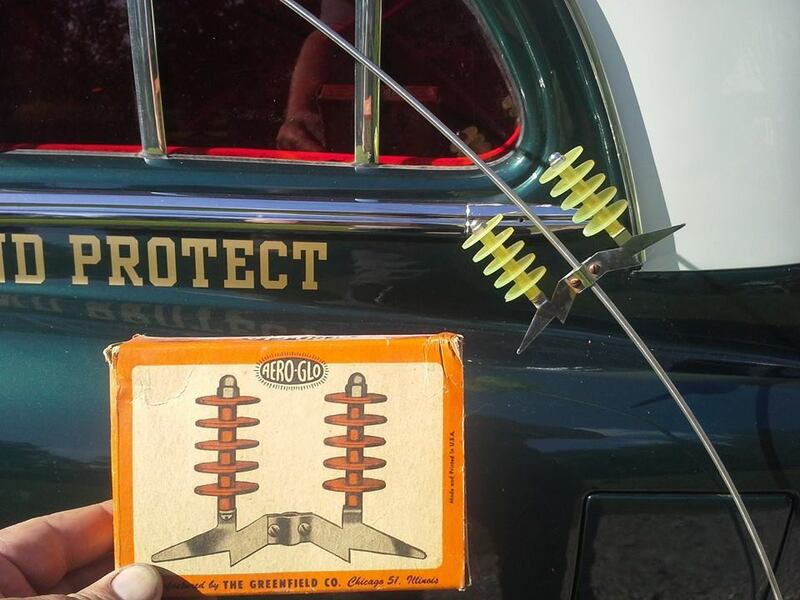 These Antenna’s might have looked really great on cars like the Modern Grecian, the El Capitola, or a lot of other wild customs from the late 1950’s early 1960’s. But on the very smooth early 1950’s styled Hirohata mercury, they always looked out of place. Fortunately Bob Hirohata might have thought the same things and they were on the car only for a short period. Later the holes for the antenna on the rear fender were even closed up completely. And the rear fenders are now completely smooth, with no sign of any antenna at all. NOS vtg Jetsons-type RADAR disc antenna booster/intensifier product for sale. Wolf recognized the odd shaped product and emailed me that we now finally know where these Hirohata Mercury antenna’s come from. Another Custom Car “mystery” solved! Enlarged section of the above photo gives us a good look at the 5-disc antennas and the batwing shaped bracket. 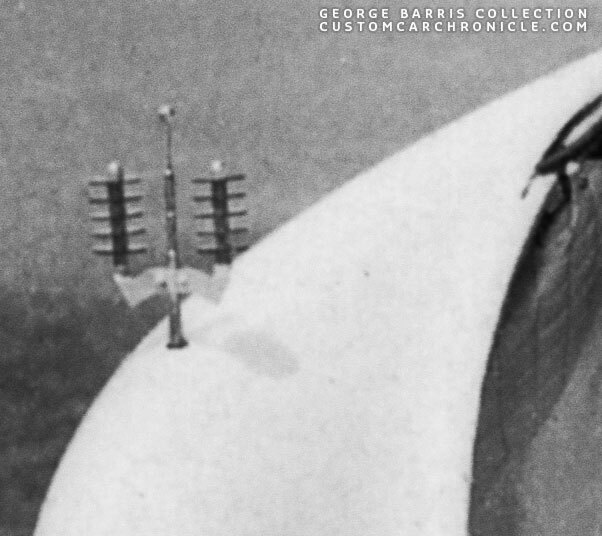 This photo from the Mad Fabricators Barris Photo DVD shows the antenna’s from another angle. This is what we know about the Radar Antenna from the ebay auction. 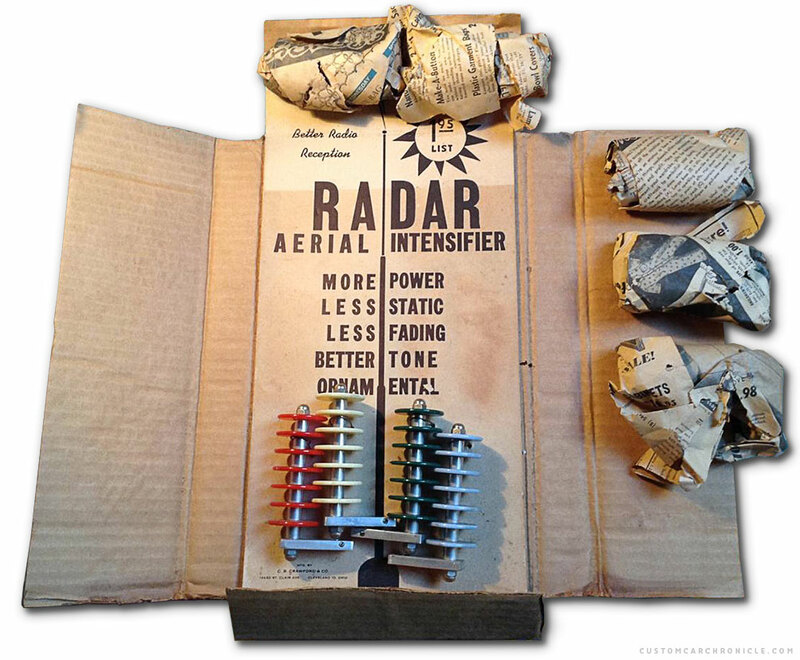 It is called the ‘RADAR Areal Intensifier‘, and according to the hype on the sales card it does do virtually everything to improve your radio reception. The Antenna is produced by C.B. Crawford & Co in Cleveland, Ohio. 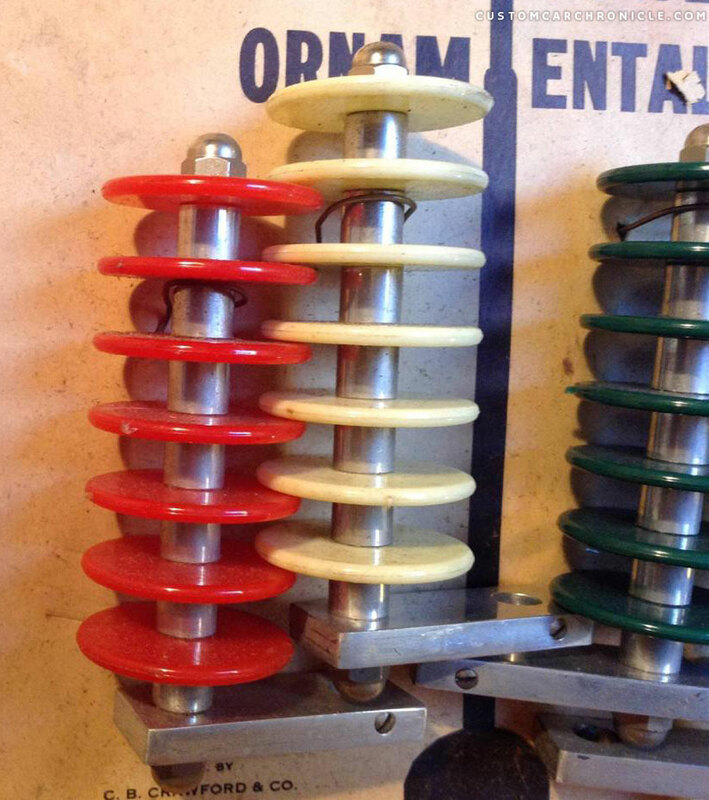 The ebay seller bought these antenna’s at from an Hershey vendor in 1992. They came in two types and in several different colors. 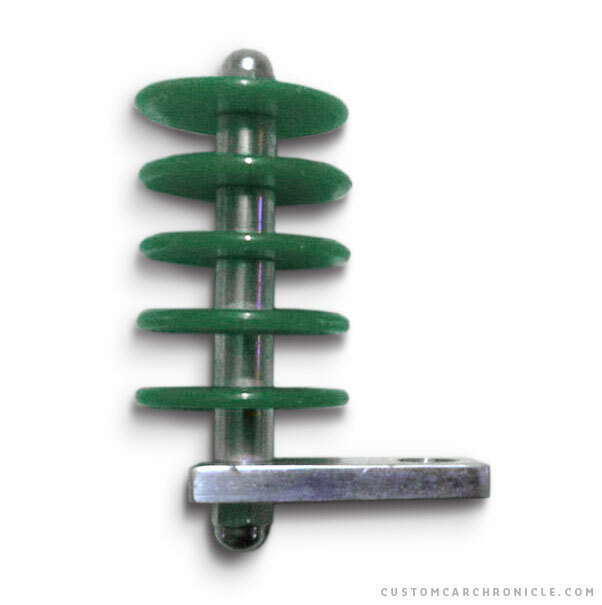 We assume Bob most likely used the green version on his 1951 mercury to match the interior dash knobs he created in white and green laminated plastic. The two types were one with 5 pastic discs, which turned out to be rare, and one with 7 disks which apparently were produced in some larger quantities. Bob used the rare 5 disk type on his Merc. This is some kind of display card showing the 7 disk type “Radar Aerial Intensifier” color options. 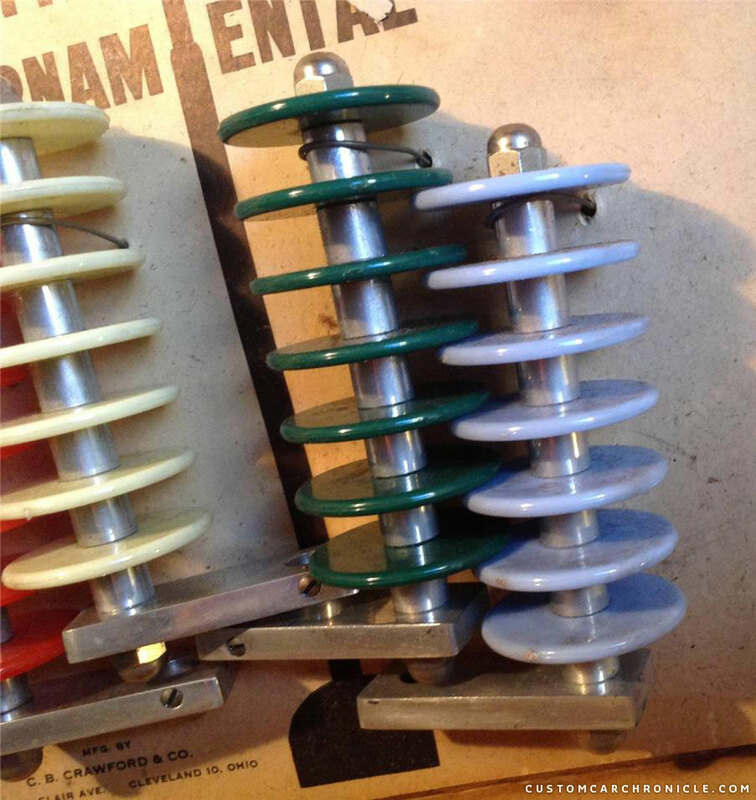 The early 1950’s newspaper wrapped parts on the top and right are the way the ebay seller found them as parts of this display set. It is probably how these were send out to the stores so they could display them on the counter. This is the same 5 disc “Radar Aerial Intensifier” unit that Bob Hirohata used on his Hirohata Merc. Bob did possibly remove the bracket and created a “batwing’ styled unit to fit around the main antenna on his Merc. It could also be possible that the units on the Hirohata merc, with the batwing like brackets, are a different type from the same company. Close up of the larger 7 disc units. After seeing the CCC-Article on these antenna’s Jan Brag send us this photo of the one he has found. 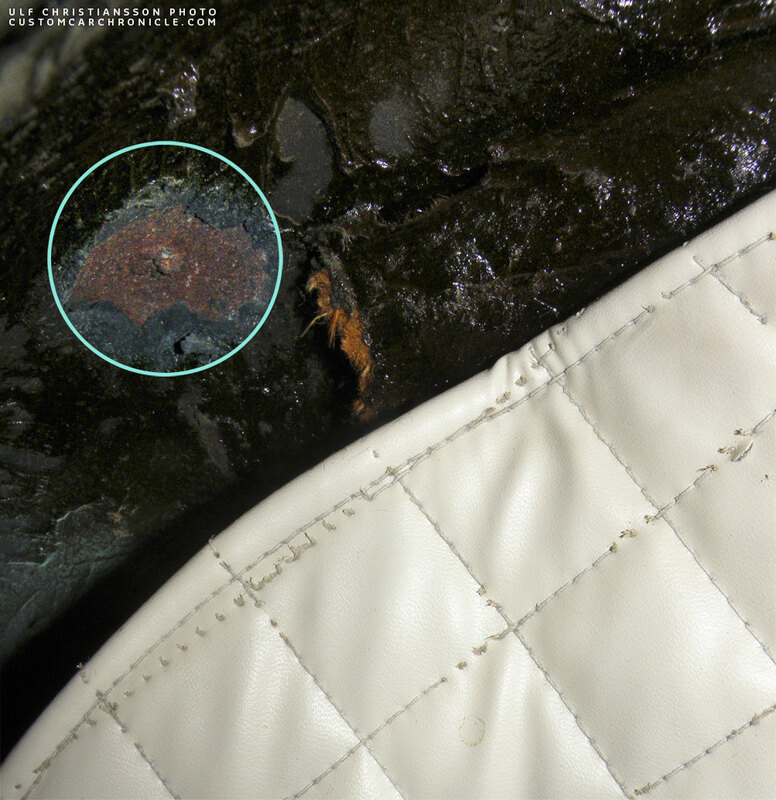 And this one comes even closer to the one on Bob’s mercury. It looks like there were more companies creating these Futuristic antenna’s in a similar style. I took this photo of the Hirohata Mercury in 2011. the car now has no antenna at all on the rear fenders. 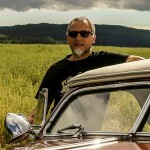 In 2011 Wolf asked Jim McNeil about the Antenna’s on the early version of the car. Jim mentioned that the holes for the antenna were welded shut at one point. Wolf took his camera, held it inside the trunk, inside the rear fenders and took a bunch of photos hoping to see the welded antenna hole. And he sure managed to capture it. I have lightened the section in the photo a bit to show the welds even better. Wow! 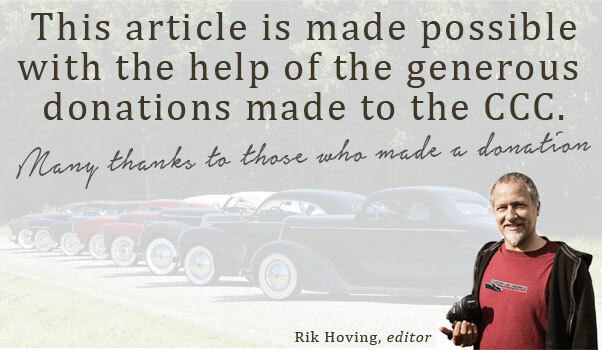 Great story, Rik! Thanks to Wolf & his keen eye for spotting this on ebay. Very kool article. I’ve loved the antennas ever since I saw the picture in the Barris book. Been looking for a set for a long time. I noticed the set on eBay but the price is way out of my league.After looking at them I could talk my self out of them because they were not like the one on the Hirohota. I did find a set for sale on the HAMB or FB for that was exactly like the ones but I was too late. I agree that it doesn’t really fit the Merc but they are still kool. Thanks for keeping us educated. Loved this article Rik! These are the kinds of details that get my brain working. I saw those in that same open trunk photo and assumed also that Bob made them himself. Thanks for digging up and sharing such great info!